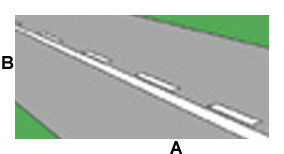 A driver may overtake by crossing the continuous white line. A driver may not cross the lines to overtake. A driver may not overtake. Only motorcyclists may overtake crossing the continuous white line. Explantion: Where there is a broken white line and a continuous white line along the centre of the road, you must obey the line that is nearest to you. In this case you may not cross the lines.